Shoprite shareholders have ignored the Namibian government’s call for a meeting to address the issue of alleged exploitation of workers at Shoprite stores in Namibia. The Southern Times has established that the Namibian government requested to meet the Shoprite shareholders in April. The request was, however, flatly rejected allegedly because the owners of Africa’s largest retail chain were too busy. Namibia’s Ministry of Labour, Industrial Relations and Employment Creation called the meeting in the hope of resolving a four-year impasse between Shoprite and its workers. Labour Minister Erkki Nghimtina and his management team decided to intervene in the hope of finding an amicable solution to the plight of workers employed by the Shoprite/Checkers group of companies. The Southern Times understands that Shoprite initially wanted to send a team comprising the Namibian operation’s management team, but the attempt was rejected by the ministry, which demanded that it wanted to deal directly with the multinational company’s board of directors and shareholders. The company then requested for the meeting to be held on May 21, a date the ministry also rejected. Shoprite Holdings, a company listed on the Johannesburg, Namibia and Zambia bourses, has been at the centre of the alleged exploitation of its workers. The company has allegedly been denying its workers in Namibia a living wage. The Southern Times has learned that Namibia’s labour ministry has gathered a dossier on Shoprite’s alleged exploitative behaviour. Some of the information in the dossier states that 42% of the Shoprite/Checkers employees in Namibia are classified as ‘permanent part-time employees’. The workers in that category perform the same amount of work as permanent employees but are not entitled to benefits and are subjected to lower wages. These employees do not have fixed time schedules and are paid less per hour than full-time employees, work an average of 30 hours per week, and some are kept on the permanent part-time employment status for more than 10 years. The dossier further records that workers, employed as till cashiers, at some Checkers stores are not allowed to sit during their nine-hour shifts. Same concerns raised in Namibia have also been aired in other SADC countries such as Angola, Botswana, Lesotho, Malawi, Mozambique, South Africa, Swaziland, and Zambia. Information provided to The Southern Times shows that the average worker at Shoprite Namibia still earns about R2,500 or less per month. As they receive no transport allowance, the workers spend between R480 and R960 per month on transport, depending on where they live. They also have to pay rent, on average R1,000 a month. In contrast, Shoprite boasted that it made a turnover of over R130 billion in 2016. During the same year, former Shoprite CEO, Whitey Basson, was paid a total package of over R100 million, which included a bonus of R50 million and an annual basic salary of about R49 million. News of Basson’s salary drove Shoprite workers in South Africa to the streets in protest. In Namibia, the company dismissed 176 workers in Rundu and Gobabis, while 100 workers are facing ongoing disciplinary proceedings, emanating from a strike in 2015. The workers downed tools after protesting to what they called was the company’s unilateral decision to give them a R200 increase. The workers felt their union representatives were not consulted and that the R200 was just too little an increase. Permanent secretary in the labour ministry, Bro-Mathew Shinguadja confirmed this week that Shoprite refused to meet a government committee for the whole month of April. “Yes, we had requested to meet up with the shareholders of Shoprite in April but they declined. They informed us that they are only available on May 21. They are demanding to meet up on their terms apparently they are occupied with other things. But you must remember that we are the State and we are not a banana republic. We will not meet up with them on May 21 but what I can tell you is that we will deal with them. We cannot be taken for a ride. The government has always been serious with this issue and we will not rest until a solution has been found,” said Shinguadja. Government sources also informed The Southern Times that if a solution is not found soon, the government might be forced to initiate a consumer boycott against Shoprite and its subsidiaries in Namibia. 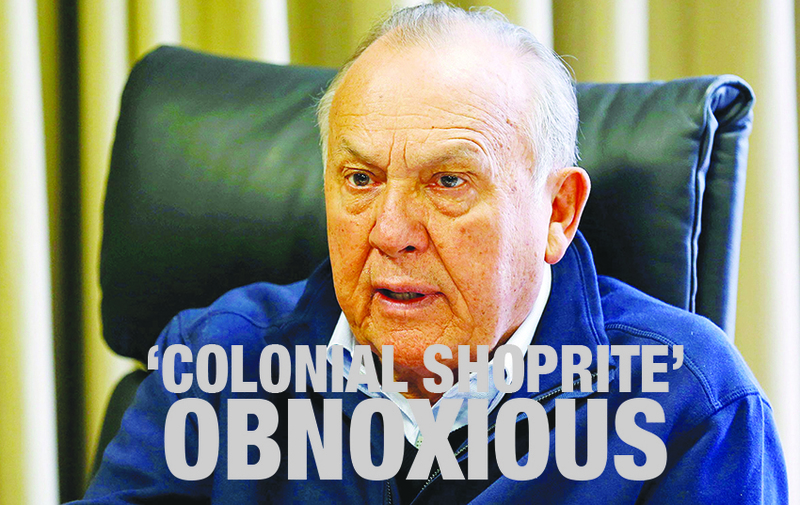 Some of the shareholders in Shoprite Holdings include the chairman, Christoffel Wiese who is the majority shareholder with 17.1 %, the Namibian Government Institution Pension Fund (GIPF) with 1.92%, Public Investment Corporation of South Africa with 12.0%, former CEO Basson with 1.52%, Government Pension Fund – Norway with 1.41%, Government Employees Pension Fund of South Africa (11.22%), among others. GIPF said the fund is a mere investor and does not directly get involved in Shoprite’s operations. This was because it acquired its shareholding on the stock exchange through an asset management firm. Questions sent to Shoprite Group of Companies communications manager, Sarita van Wyk were not answered at the time of going to print. During October, last year, eight cashiers, at the Shoprite Pelican Park store in South Africa, were dismissed after they accepted tips. The workers were quoted saying there was no money missing from their tills and tips have been allowed for several years, but the store manager handcuffed them (all women) and called the South African police service to arrest them. In Malawi, media reports state that compassionate leave for Shoprite employees is available for permanent workers only. Permanent workers employed for less than a year, go on maternity leave without pay. In 2003, it was revealed that Shoprite forced its employees to sign a contract that states that, “you agree that from time to time you may be scheduled and required to work up to 12 hours a day, inclusive of meal intervals, without overtime pay”. In Swaziland, some employees have complained that even though they are classified as managers they cannot afford to eat lunch every day except on paydays. In Namibia, Shoprite seized the opportunity provided by a divided labour movement to sideline the unions altogether. As a result, the company has for years ignored the workers and their union representatives’ demands when deciding on increases in salaries and benefits. It was also reported that workers at a Checkers store in Windhoek were also compelled to clock in when taking bathroom breaks. Namibian labour researcher and unionist Herbert Jauch, this week, told The Southern Times, that the attitude of Shoprite towards Southern African Development Community governments, unions and workers is that of colonial masters. “They are arrogant. They think they are untouchable throughout the region. They are constantly in blatant violation of the workers’ rights. They are acting like colonial masters and you can quote me on that,” he said. Jauch, who has been vocal regarding the ill-treatment of workers in Namibia especially by Shoprite, added that the company must drop the charges and they must understand that the 2015 strike was a result of provocations from their ill-treatment of workers. 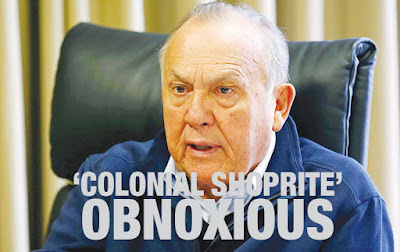 He urged the Namibian government to take the first steps of not purchasing goods from Shoprite and their subsidiaries.